Area Ranked 45th in the U.S.
Population Ranked 49th in the U.S.
Vermont ( i/vərˈmɒnt/) is a state in the New England region of the northeastern United States of America. The state ranks 43rd in land area, 9,250 square miles (24,000 km2), and 45th in total area. Its population according to the 2010 census, 630,337, is the second smallest in the country, larger only than Wyoming. It is the only New England state not bordering the Atlantic Ocean. Vermont is the smallest landlocked U.S. state, and is one of two landlocked states in the northeast (the other being Pennsylvania). Lake Champlain forms half of Vermont's western border, which it shares with the state of New York. The Green Mountains are within the state. It is bordered by Massachusetts to the south, New Hampshire to the east, New York to the west, and the Canadian province of Québec to the north. Originally inhabited by two major Native American tribes (the Algonquian-speaking Abenaki and the Iroquois), much of the territory that is now Vermont was claimed by France in the early colonial period. France ceded the territory to the Kingdom of Great Britain after being defeated in 1763 in the Seven Years' War (also called the French and Indian War). For many years, the nearby colonies, especially New Hampshire and New York, disputed control of the area (then called the New Hampshire Grants). Settlers who held land titles granted by these colonies were opposed by the Green Mountain Boys militia, which eventually prevailed in creating an independent state, the Vermont Republic. Founded in 1777, during the Revolutionary War, it lasted for fourteen years. While independent, it abolished slavery. When it joined the Union, it was the first state to have abolished slavery. 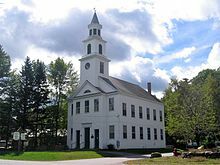 Vermont is one of seventeen U.S. states (along with Texas, Hawaii, the brief California Republic, and each of the original Thirteen Colonies) that each once had a sovereign government. In 1791, Vermont joined the United States as the fourteenth state and the first outside the original Thirteen Colonies. Vermont is the leading producer of maple syrup in the United States. The state capital is Montpelier, which with 7,705 people is the least-populated state capital in the country. Its most populous city is Burlington, which has a metro population of 211,261 residents.